Peel potatoes and cut into even sized chunks, cover with boiling water and simmer for 10 minutes. 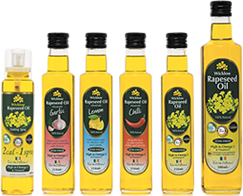 In a roasting tin, place 2 tablespoonfuls of Rapeseed Oil and place in oven. 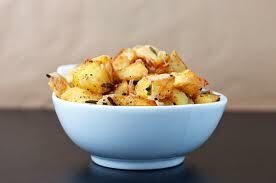 Drain potatoes, replace lid and shake pot vigorously to 'fluff them up'. Take oil from oven and place on hob. Put potatoes into hot oil (should sizzle) and baste. Sprinkle with some sea salt, garlic granules (optional) and a herb of your choice (e.g. rosemary). Return to oven and cook until crisp and golden (about 45-50 minutes).